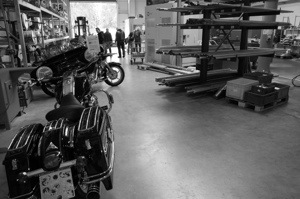 A Day at Thunderbike | Phaedrus rides a motorcycle, too, you know! So, my two weeks of summer holidays have begun this weekend, and what better way to start them than with a long ride? 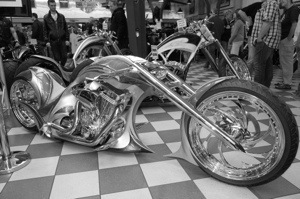 Aimlessly surfing motorcycle-related websites, a destination presented itself: German custom chopper maker and Harley Davidson dealer Thunderbike had an event together with a Kustom Kar club (or should that be Klub?). A ride of 361 km stood between me and these strange objects of attention, so I started early. No problem there, I always make the best out of my sleep disorder! Sunrise over slight mists in the Waldhessen region was especially beautiful. The curvy country roads were almost bare of other participants and up until noon, temperatures were a bit too chilly for my perforated leather jacket. I put on my rain jacket over that, got warm and instantly lost 100 style points. 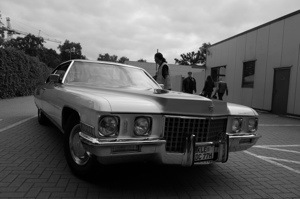 Staying in style was the prerequisite at Thunderbike’s event. 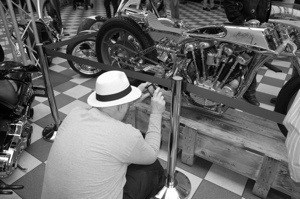 The gentleman in the Panama photographing Thunderbike’s award-winning café racer ( which looked strangely 2/3 size to me, but then again, I’m a big man…) was the big exception. All those dental lawyers sported custom leathers, factory T-shirts, tattoos, cigarettes and a badass attitude. Come to think of it, not a patched rider in view. So, all “Wild Hogs” (without the irony), no “Sons of Anarchy”. So, after a tour of the grounds and the workshops, I bought a smiling skull ring in memory of Johnny Cash (my lucky graveyard boots are the chopper boots I ride in). 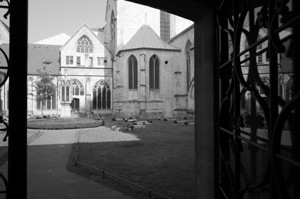 Then I went further on up the road to Münster, where my brother lives. Although it was a Saturday, he still had work to do in his institute (those pedagogical textbooks don’t write themselves, and he is much more diligent than me), and so I relaxed in a café and listened to the stained glass windows in two churches ’til he was done for the day. A hearty pasta meal at his loft concluded this day. It is the next morning as I write this, and as I look outside, it is even foggier and chillier than yesterday. So, full rain suit it’ll be, deep-sea trawlerman on a Harley. 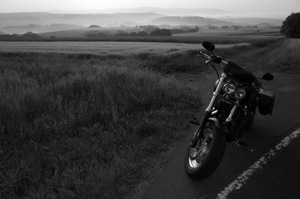 I’ll try and provoke the disdain of a few posers on my ride back! This entry was posted in bike, custom bike, Harley-Davidson, material, motorbike, motorcycle, photos, rides, Thunderbike and tagged chopper, kustom kars, Thunderbike. Bookmark the permalink. 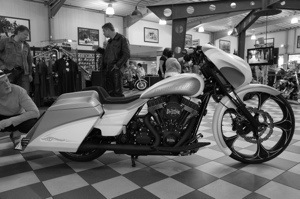 Pingback: Spring Triangle | Phaedrus rides a motorcycle, too, you know!